Valentine’s Day can be a stressful day for any elementary school student. Being required to give a card to each classmate means having to select the right sentiment for friends, crushes (both open and secret), enemies, and outcasts. I thought it would be a fun exercise to examine some school valentines from the past and breakdown each card’s meaning and target audience. Whoa. The perfect card. This one says it all, huh? A startling amount of emotion, but not romantic desire. Instead, a spirited message infatuated with life. And the artwork really delivers on the promise of the verse. 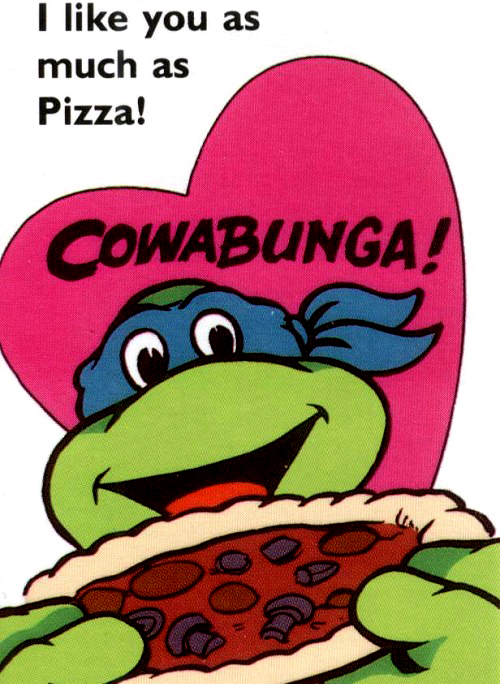 Leonardo, his eyes completely dilated from joy, about to take a bite into an entire pizza. Not a slice. But the whole thing. As if, for a brief moment, across the thin edge of paper, two people can hold all of life itself in their hands. Give to: Any kid in class you don’t hate. At first glance, a very safe pick. Ziggy, asexual and gender fluid, expressing the receiver has accomplished some unspecified win. Certainly not a #1 valentine, as this card is clearly meant to provide distance between the sender and receiver. The underlying mockery of romance combined with the quasi-human Ziggy tells you as much about the sender as it does the receiver. Purchasing a package of Ziggy Valentines –- so purposely far from showing any human connection –– betrays either a barely-hidden ocean of contempt the sender has for the possibility of love, or a sociopath’s unsettling imitation of baseline human emotion. Give to: That weird kid no one likes. A comedy! Two mutant recidivists, Bebop and Rocksteady, providing a wicked satire of the late 80s early 90s. Both a protest against the corporate poisoning of the environment (the characters were created by the waste product of nuclear energy) and an obvious commentary on the skyrocketing violent crime rates in the US at the time. 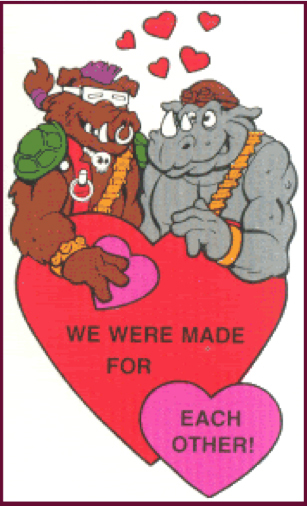 Bebop the punk and Rocksteady the mercenary were a comic take on the rising fears that our cities were being lost to super predator led street gangs. 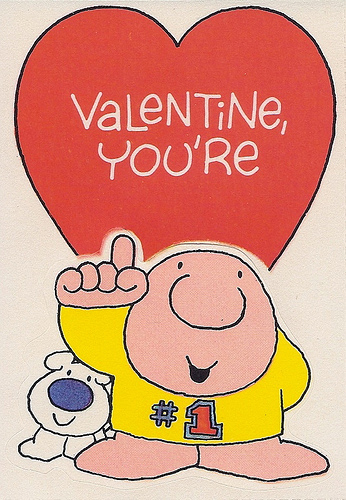 To have these characters on a Valentine’s card hides any romantic intent behind an impenetrable level of irony. This is either a card from one rapscallion to the next, perhaps with a note on the back setting up a rendezvous to sniff glue, finger, or sip on some lean, or a card given to an actual crush that the sender is too fearful of alerting to his/her real desire, be it hetero- or homosexual. Certainly a dark card, but one that also pointedly takes us out of our comfort zone. This challenging work rewards more than a second’s glance. 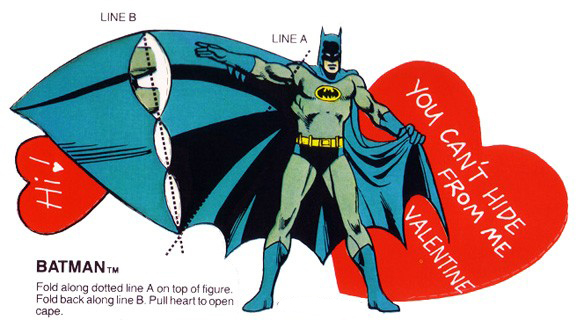 While the fascist rich orphan Batman tells the sender they are unsafe at any distance, the purposefully confusing folding mechanism described on the card comments on the male ego, impotency, and underlying maternal void. For this card, high risk brings high reward. The thoughtful structure of the piece and the time commitment needed to master its folding cape, allows the sender to remain present in the thoughts of the receiver long after other cards have been read and discarded. Further proof that boundary-pushing art belongs in our public schools. Give to: That special someone.